You are here: Home › Stayfitcentral Health & Fitness Blog › Health & Fitness Blog › Buyers Guides › Beta Alanine Benefits – How It Will Help You Perform Your Best! Beta Alanine Benefits – How It Will Help You Perform Your Best! Beta Alanine Can Help You Increase Your Workout Intensity! Beta alanine’s benefits are misunderstood or unknown to many, including sports scientists and professional athletes. Many believe it’s like creatine, helpful at quickly building muscle and improving your strength and power. Others think that it’s an endurance booster, useful to take if your run, bike, or swim long distances at a slow to moderate pace. In fact, neither are correct. The benefits of beta alanine comes from its ability to ‘buffer’ or delay fatigue during intense exercise. The more you can do this when you’re exercising intensely, the longer and harder you can perform.As an example, think about how it feels to perform 5-10 sets of squats or sprints or an all out sprint for 400 meters. Your legs, back, and chest feel like they’re on fire. Catching your breath seems impossible.Supplementing with beta alanine can help minimize this effect so you can delay muscular failure and get more from your body. 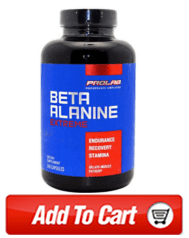 After reading this article you will know all of the benefits of beta alanine supplements. This includes the activities and sports it helps most, which beta alanine supplement is best, and how to get the most from your daily dose. As I write above, beta alanine mainly acts as a ‘buffer’ for our muscles during intense activities like a Crossfit WOD, repeated hill sprints, and sports like basketball, soccer, and tennis. Listed below are the benefits you can get from taking beta alanine correctly. The science and thousands of individual customer reviews show that taking beta alanine every day for a couple of weeks will enable you to do more work (train longer) at high intensities (harder). This is for activities that last between 60-180 seconds. 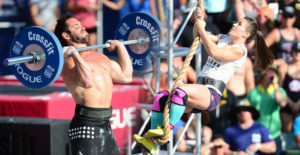 Example workouts that fit these parameters are: several sets of 100 rep kettlebell swings, a MetCon, or sprint workouts. After a few weeks of supplementing with beta alanine you’ll be able to push yourself as hard, or maybe even harder at the end of your workout as you did at the start. You’re also likely to finish your sets in less time too. A study performed on college aged athletes (football and wrestling) who regularly lift weights shows that taking beta alanine can help you build more muscle than lifting alone. In this study, the guys in the beta alanine group gained an extra 2 pounds of muscle in 8 weeks. Those only lifting weights gained half as much. This is an impressive amount of muscle to gain in just 2 months, especially when you don’t make any changes to your diet and have been lifting weights for a long time like the guys in this study. 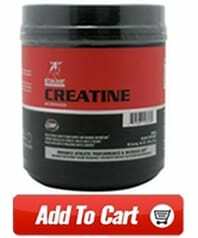 You may get even more benefit in this regard by taking it with creatine monohydrate. A study on college wrestlers – who were dieting to lose weight – finds that beta alanine can speed up your fat loss efforts. When compared to the group taking a placebo, the wrestlers in this study lost twice as much fat. Both groups of guys lifted weights during the study and ate their normal diet. The guys in this study taking beta alanine also gained muscle (1 pound) while the placebo group lost the same amount. This is the last thing you want to happen when you’re losing weight since it can compromise your performance and health. Losing muscle weight will also compromise how good you can look naked! Which isn’t good. On a personal note, I took beta alanine when I was working out and dieting to lose 30 pounds of excess fat. It definitely helped me work out harder than when I wasn’t taking beta alanine and the weight did come off easier than it has in the past when I didn’t take it at all. In addition to being able to work out harder, another benefit of beta alanine is that it can help you finish faster too. Studies show that taking beta alanine decreases the time it takes to perform repeated sprints over short distances. This difference, even if it’s just a few seconds or less faster can mean the difference between winning and losing. While it’s pretty clear that it works best in relatively short duration (30 sec – 1.5 min) activities, beta alanine seems to benefit most people who take it properly. So, whether you’re a guy or girl aged 18-70, a newbie in terms of your fitness level or an elite athlete the research shows it can work. Remember though, beta alanine will probably not benefit you if you only do workouts and sports that don’t require any repeated bursts of intense activity. This includes sports like jogging, long distance cycling, golf, or distance swimming. That being said, if you are a distance runner, swimmer, cyclist, etc. does not mean that you cannot benefit from beta alanine supplements. If you regularly include sprinting (intervals, fartleks, etc.) into your training it can help. If you are an endurance athlete who does these or similar style workouts taking beta alanine can help you put more effort each sprint and as a result, improve your fitness and speed faster. This will help you run harder and quicker on race day, leaving your competition in the dust! Crossfit – MetCons, interval training. Weight Lifting – especially supersets, complexes, and other high intensity schemes. Basketball, Hockey, Soccer – sports which require repeated sprints with little rest. Cycling, Rowing, Running – between 200- 800 meters. I first used beta alanine 5 years ago. When I first took it I was doing a lot of stair and hill sprints and kettlebell workouts and complexes. These are workouts that beta alanine benefits the most (high sets lasting about a minute or with very little rest between each). After taking beta alanine for about 2 weeks I felt and noticed a huge difference. I was much less fatigued than normal between sets of sprints of intense kettlebell complexes. Another benefit of beta alanine for me is that I increase the weight I’m using faster than normal. Within a few weeks of taking it I jumped from doing snatches with 35 lb. kettlebells to 70 lbs. Beta alanine also benefits my surfing. When I first began surfing my upper body strength-endurance was pretty poor. This made it difficult to paddle out to the breaking waves. Catching waves was trickier than it should have been too because of my weakness. Supplementing with beta alanine for a couple of weeks made a huge difference. I was much less fatigued when paddling and able to make it out and catch more waves than most beginners. I continue to take it today and plan on doing so for the duration as its benefits are too great to pass up. The supplement I take and recommend is Prolab Beta Alanine Extreme. It uses the Carnosyn brand of beta alanine which is the only type proven to work in over a dozen research studies. I also like that Prolab Beta Alanine Extreme is convenient to take. All I have to do is take 2 easy to swallow capsules 4 times a day. This is the exact dosage found to work done by researchers, coaches, and athletes alike. Every bottle lasts 30 days when used as directed. There are no worthless fillers or bogus ingredients either, just pure beta alanine. Click here to buy Prolab Beta Alanine Extremefrom our online store. There are a few things that will ensure you’re getting as much benefit as possible from your beta alanine supplement. This ensures that you’re getting a type that’s proven to work in numerous research studies. Supplements using other types of beta alanine cannot make this guarantee and as a result, you may get less than optimal benefits. The research finds and supplement companies recommend that you take 4-6 grams a day for 3-4 weeks to fill your muscles and allow the beta alanine to begin working for you. After you have taken this dosage for about a month, it’s okay to cut your daily dose in half. This will keep your muscles loaded and the benefits working for you. Beta alanine will not benefit you if you’re not training hard on a regular basis. This doesn’t mean you have to train until you puke or your muscles are completely exhausted. Just make sure you are pushing yourself hard, say an 8 out of 10 on the effort and pain meter, on a regular basis. I’ve personally found that the harder I work out, the more benefits I get from beta alanine. This includes being able to push myself longer (more sets and reps), making bigger increases in the weights I use, more muscle, and less body fat. This gives your muscles a one-two punch. Beta alanine enables you to train harder, longer and creatine helps you put more effort into every rep. Taking these supplements together is also likely to help you build muscle faster than taking either alone. Now you know the benefits of beta alanine. All that’s left is for you to give it a try and see for yourself how it can help your workouts and athletic performance. Let me know how Beta Alanine improved your workout! Curt. Beta Alanine – How Much Do I Need And How Should I Take It?